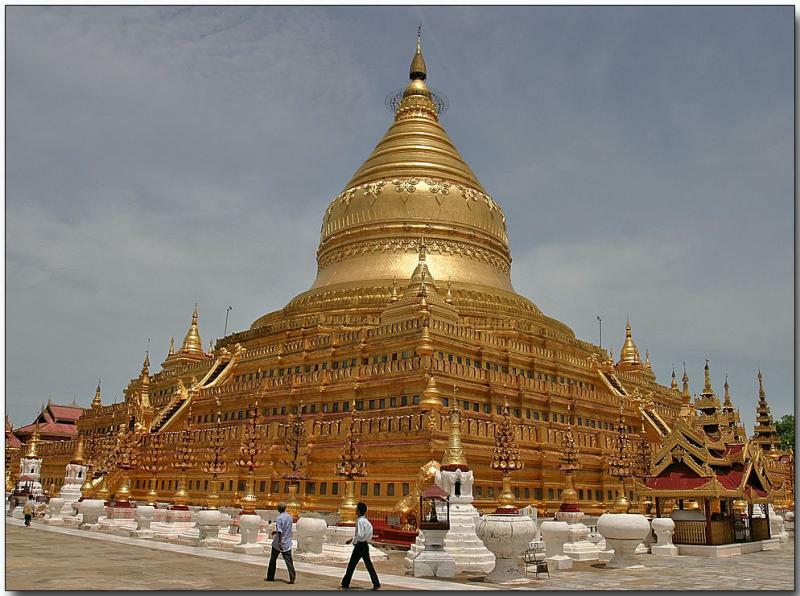 The Shwezigon Paya (pagoda, stupa or zedi), was built during the reign of King Anawrahta (1044-1077) and is one of the Bagan area’s, and Myanmar’s, most significant religious structures. Located four miles northeast of Old Bagan, it served as a prototype for many later stupas built throughout Myanmar. The Shwezigon is also a major national center of worship. Pilgrims come from many parts of Myanmar for its festival held during the Burmese month of Nadaw (November/December) both because of its historic character and because of its religious significance for Burmese Buddhism. While the Shwezigon was one of the earliest symbols of the triumph of the ‘purified’ Theravada Buddhism, it was also the first pagoda to allow ‘nat’ images - pre-Buddhist spirits who had the power to do good or evil- within its walls.